Add The Nail Parlour to your favourites! The Nail Parlour incredibly luxurious Lavender Candlelight manicure and pedicure! 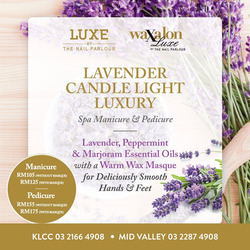 Introducing our incredibly luxurious Lavender Candlelight manicure and pedicure! Featuring a warm wax masque decadently poured onto skin from a soy balm candle and the relaxing aromatherapeutic fragrance of lavender, peppermint and marjoram essential oils, this is our most pampering service yet! Get a pair of Ardell lashes FREE with every purchase of any manicure or pedicure that comes with a masque! 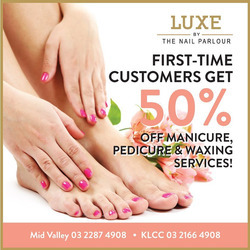 The Nail Parlour are experts in hand and foot care, providing the best manicure and pedicure services. 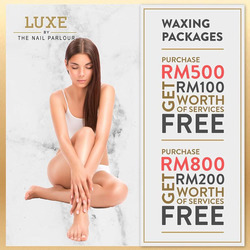 Do you want to receive more offers from The Nail Parlour by email?